After issuing the second iOS 8.1 beta on Tuesday, Apple released updated golden master candidates for OS X 10.10 Yosemite and Xcode 6.1 to developers for testing ahead of an expected launch later this month. The latest OS X Yosemite and Xcode 6.1 GMs come exactly one week after the first release candidates were seeded to developers. Golden master identifiers are usually reserved for final or near-final software versions, signifying Apple is about to announce public availability of its next-generation Mac operating system. Today's Yosemite build is labeled 14A386a, compared to the initial GM candidate's 14A378a designation. When it sees launch, OS X 10.10 Yosemite will bring a number of so-called Continuity features to the OS, allowing iOS device users to interact with Macs in new ways. For example, Macs will be able to tether with an iPhone to place and receive cellular voice calls, continue email conversations and perform other cross-platform operations. 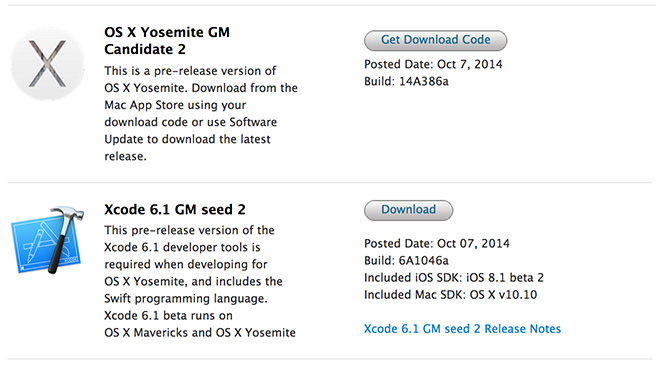 Since the first Yosemite Developer Preview was issued in June, Apple has gone through a total of eight developer versions and four public beta releases. Developers can download the latest OS X 10.10 Yosemite and Xcode 6.1 GMs through Apple's Developer Portal or the Mac App Store's Software Update mechanism.